Recent changes in the law mean that certain electrical projects must be carried out by competant electricians, much like gas work must be carried out by Gas Safe (formally Corgi) registered technicians. This was brought in because of the dangers posed by amateur DIY electricians. NICEIC approved electricians mean that you can be sure of the safety of any installations that are carried out. These rules don't cover simple jobs such as replacing the cover on a electrical socket, or a new light switch, but considering that electrical problems are one of the leading causes of fires in the home you'll be glad to know that our electricians are happy to take on any job, no matter how small. The government recommend that you have your wiring checked every 15 years. If you have moved home in that time and you have reason to suspect that your wiring is older than that, you should have someone who knows what they are doing check that it is still in good condition. Although wiring is generally copper and immune to rust, there are problems that can develop over time, and it is better to have someone check that it is ok. Whether it is the wiring in your home or just a single applicance, our electricians can help, and you can rest assured that your home is safe. 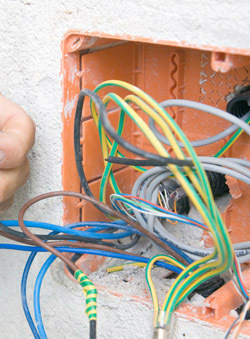 We have a reputation for being top quality electricians for Exeter and right across Devon.